You can view the mobile apps that are connected to your account and can revoke the access if needed. This is the page where you can view your mobile access tokens for “Mahara Mobile”, a mobile app, available for Android and iOS. App: You can see the name of the app, e.g. Mahara Mobile, as well as information about the device from which you connected. If the site administrator allowed users to generate tokens manually, you also see the “Manually created” option. 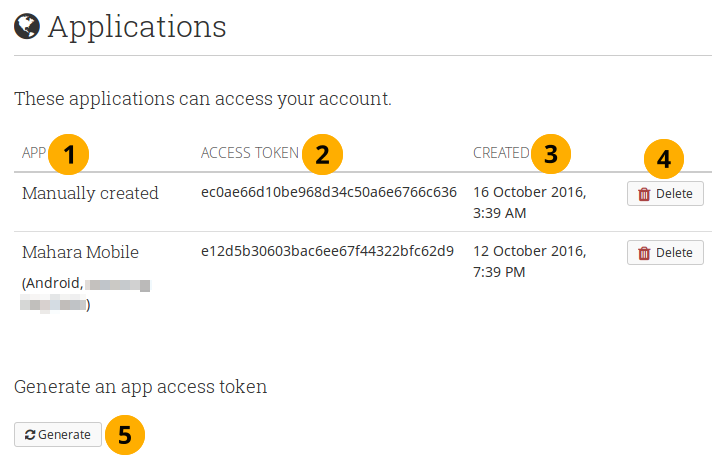 Access token: You see the access token column only when the manual token generation is enabled as you need to be able to copy it. Created: The date when the access was granted. Click the Delete button if you want to revoke access to a particular device. Click the Generate button when you want to create a token manually. This option is only available if the site administrator enabled it. You can then copy the token into Mahara Mobile to authenticate your account. The majority of authentication methods should allow for the automatic setting of an access token. However, if you log into your Mahara account via Moodle only, you would need to generate your access token manually.